General Information: Even though Halloween is over, this fantastic cucurbit is still available and a fantastic addition to winter menus. The fruit has a rich deep flavor that enhances ravioli, soups, and rich winter curries; these pumpkins can be processed and frozen for a winter's worth of delicious organic flavor. The seeds make a great garnish for salads and the flesh is a deep orange color that is a winter classic. At first growing dark green, sunlight eventually turns the color of this variety to its characteristic color when it reaches maturity. An old variety native to France, the French name is Musque De Provence we know this as the Fairytale because it looks like Cinderella's coach. Low in calories and high in fiber, pumpkins are a good source of beta-carotene which converts into vitamin A. Pumpkin seeds are high in protein, iron, and the B vitamins. 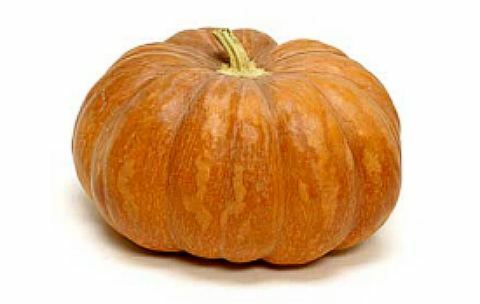 Fairytale pumpkins can be used in any pumpkin or winter squash recipe. Their rich flavor is perfect in soups as a savory item or used as a sweet filling in pies and tartlets. Excellent flavor combinations include coconut, cream cheese, feta cheese and gorgonzola.